Though many private sector companies have approached the national carrier for leasing, the airline authorities have said that the preference will be given to state-owned entities. LIC, SIB, ONGC, etc. have showed their interest in leasing Air India property in Delhi. The monetization program was launched in February. The plan was decided to clear off its debt. As part of its monetization program, Air India will lease out its properties across India. Some overseas properties also will be leased. By leasing out the real estate assets, the airline plans to acquire Rs.5000 Cr. The lease plan will be executed within three years. Despite the overburden of debt, the national carrier does not want to sell the properties to any private companies. Life Insurance Corporation, Oil and Natural Gas Corp and State Bank of India are in the forefront to grab the property. 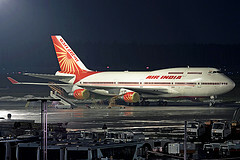 Speaking about the preference of government entities, a senior executive of Air India said that if the property is leased to one of them it will remain as the property of the government. This entry was posted in Real Estate News and tagged Air India, Air India Delhi Properties, Delhi properties, LIC, Life Insurance Corporation of India, Oil and Natural Gas Corp, ONGC, sbi, state bank of india by designer. Bookmark the permalink.